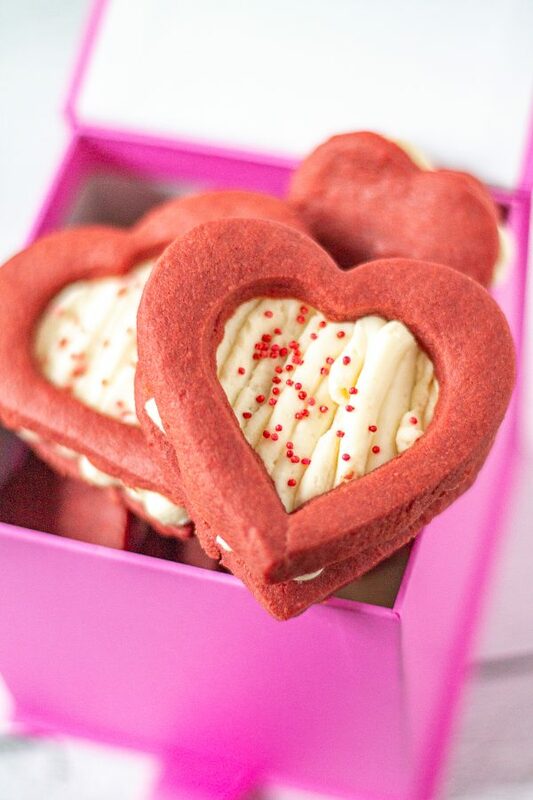 Red Velvet Shortbread Cookies with Cheesecake Filling are a Valentine’s Day treat your sweetheart will love. 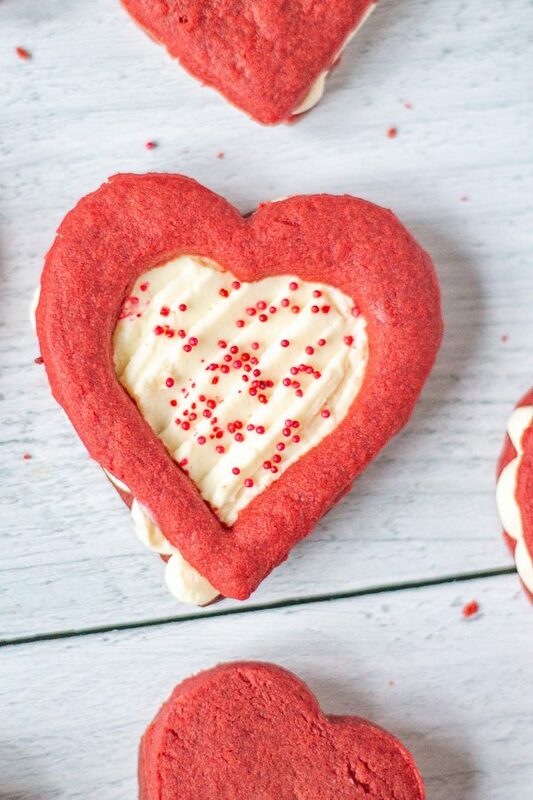 These cookies take the flavor of a red velvet cupcake, and put it into a cookie. The shortbread is buttery and sweet with a hint of cocoa taste. 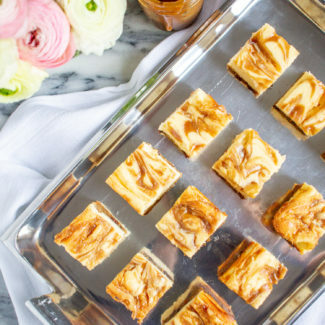 The cheesecake filling has cream cheese, mascarpone, and vanilla. 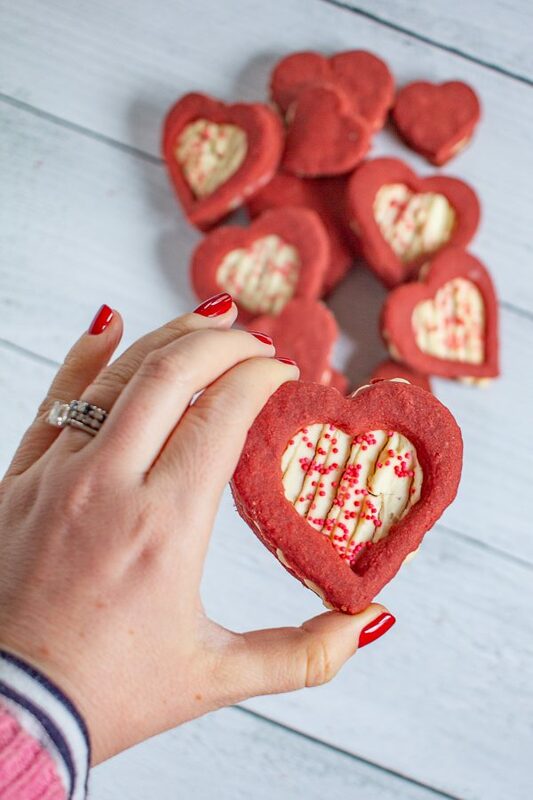 Red velvet shortbread cookies are sweet without being too sugary, and I love the richness and creaminess of the no bake cheesecake filling. 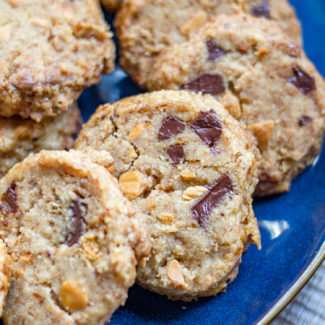 My husband, Charles, doesn’t have much of a sweet tooth, but he loved these cookies. Since Valentine’s Day is coming up, I made heart-shaped cookies. I made some larger cookies with a heart cut out so that you can see the cheesecake filling in addition to some simple sandwich cookies. 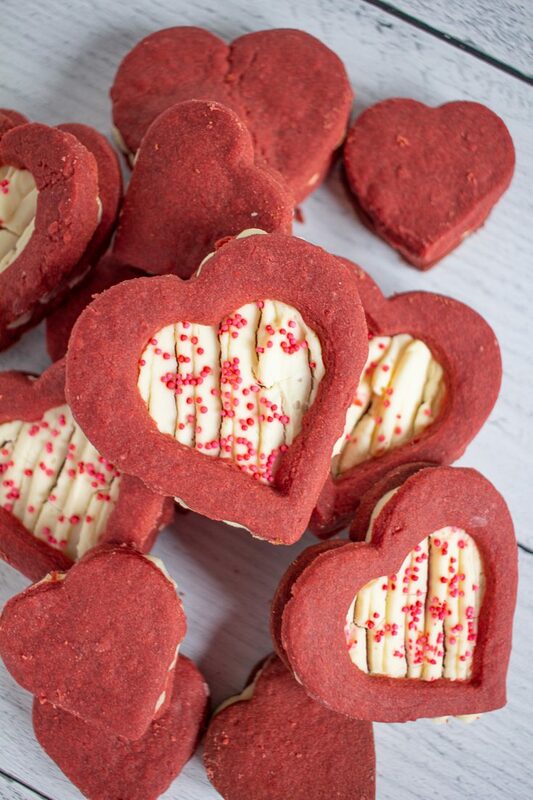 You can prepare the red velvet shortbread cookie dough a day or two in advance. Just store it in your fridge if you want to make it in advance. The dough needs to chill for just about 45 minutes before you roll it out. The dough will be too soft to roll out immediately, and 45 minutes seems like the sweet spot where the dough is not too hard and not too soft to roll out easily. The number one thing to know about these cookies is that they taste best fresh. Once you add the cheesecake filling to the red velvet shortbread, it starts to lose some of its crunch. The other thing to know is that once you add the cheesecake filling the cookies need to be stored in the fridge. There is a trick to rolling out the shortbread without using flour. 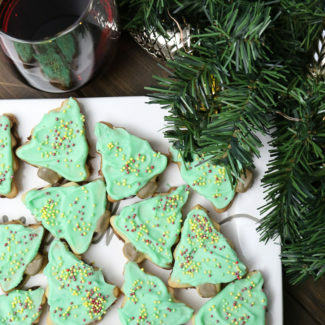 You want to avoid using flour because you don’t want to ruin the beautiful red color of the cookies. Instead of flouring my work surface, I like to use a silcone mat as my work surface. Then I place a piece of parchment over the shortbread dough when I roll the dough out with a rolling pin. It works really well! If you don’t have a silicone mat, just roll the dough out between two pieces of parchment. 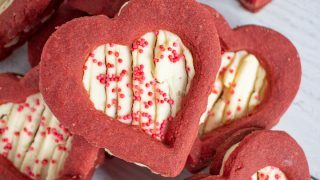 Red Velvet Shortbread Cookies with Cheesecake Filling are a Valentine's Day treat your sweetheart will love. 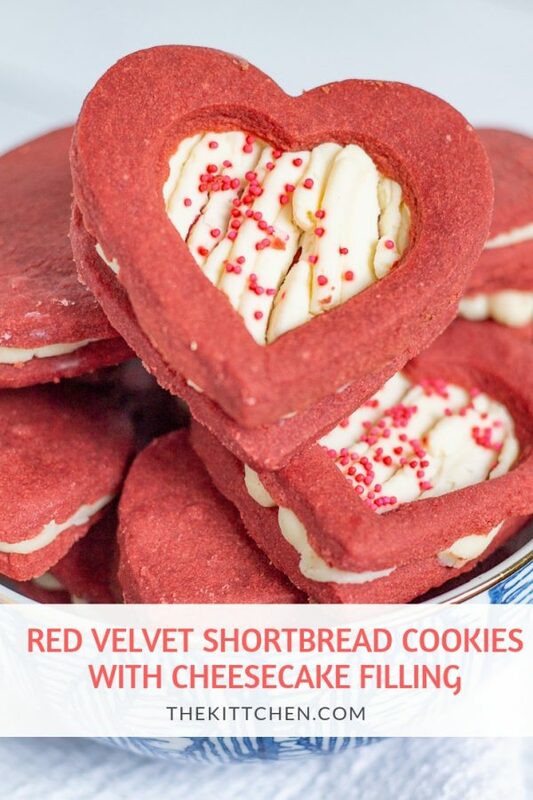 These cookies take the flavor of a red velvet cupcake, and put it into a cookie. 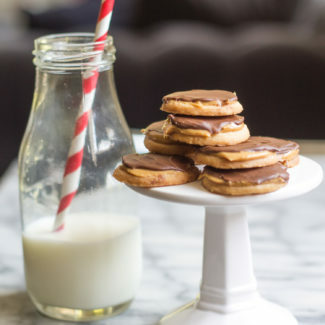 The shortbread cookies have a touch of cocoa flavor, and they are stuffed with a rich no-bake vanilla cheesecake filling. Whip the butter in the bowl of an electric mixer. Add the powdered sugar, and once combined add the vanilla. Scrape down the sides of the bowl as necessary. Next, add the semolina. Then add the flour 1/2 cup at a time, waiting for it to be fully mixed before adding more. Lastly, add the cocoa powder and the red food coloring. Divide the dough into two round flat discs, cover with plastic wrap, and place in the fridge for 45 minutes. While the dough is chilling, prepare the cheesecake filling. 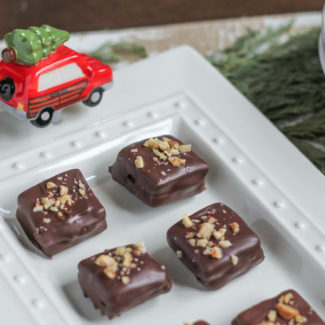 Combine all of the filling ingredients and beat together with an electric mixer. Leave out to come to room temperature so the cheesecake filling easily spreads over the cookies. 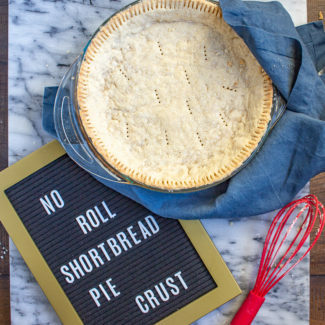 Once the dough has chilled and is workable, roll it out either on a silicone mat with parchment over it, or just between two pieces of parchment. I like to roll the dough out so that it is between 1/4 and 1/8 of an inch thick. 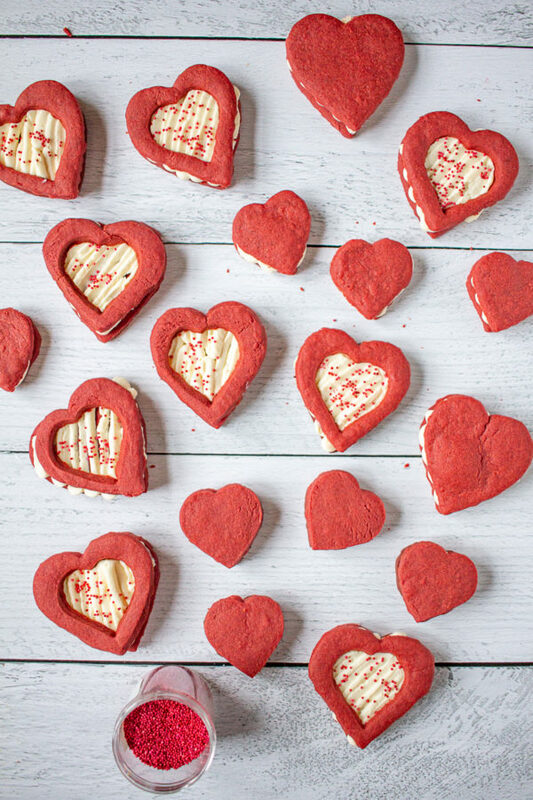 Use cookie cutters to cut the dough into hearts. *Important - do not cut the smaller hearts out of the large hearts yet - wait until you chill the dough again so that everything keeps its shape and doesn't fall apart. Chill the cut-out cookies in the freezer for 10 minutes, this set will make sure that the cookies will hold their shape and not spread out as they bake. Heat your oven to 350 degrees and make sure an oven rack is in the middle of your oven. Once the oven is preheated and your cookies are chilled, transfer the cookies to a parchment lined baking sheet. Now is the time to cut out the mini hearts if you want to. Bake the cookies of 7-10 minutes, until the bottoms are just starting to toast. Let cool. Transfer the cheesecake filling into a piping bag and pipe the filling onto the red velvet shortbread cookies and assemble the sandwich cookies. Store the cookies in the fridge.